Today’s entry is for the First Annual Bronco Nagurski Flick Fest at My Floating Red Couch. The fest runs until September 3rd — Read ’em all here! There are so many quirks. missteps and mistakes in The Best of Times (1986) that it overrides what would otherwise be some fine comedic and sentimental moments. The story, such as it is: The town of Taft, California, is a town of losers. Jack Dundee (Robin Williams) narrates an opening montage of a series of failures the town has endured, up to and including a November, 1971 football game lost to bitter rival Bakersfield. Why a small town like Taft is playing a large city like Bakersfield, I do not know. 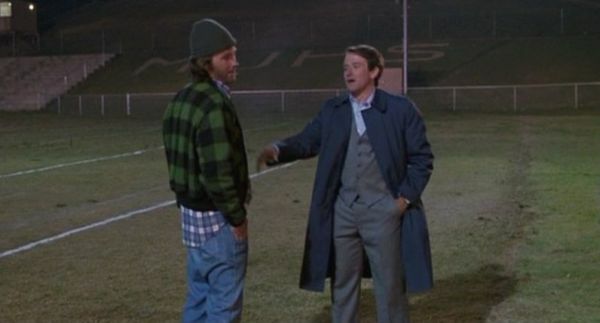 During that 1971 football game, star quarterback Reno Hightower (not joking) has his knees smashed, ruining his burgeoning football career, and professional doofus Jack Dundee misses the important toss that would have won Taft the game. Dundee still mopes about this and everyone, including his father-in-law, tease him about it. Because this is a town that is still stuck in high school. That’s the plot, which makes sense. Nothing else did! * Reno and Gigi were pregnant by the big 1971 Homecoming game, and unless I’m mistaken, having to get married the second you graduate from high school would have been just as big of an obstacle to overcome as knee problems — especially knee problems that don’t cause very much limping, allow you to do physical labor as a mechanic and play a hard game of football 13 years later with no lasting effects. * The Dundees have a daughter who can only be about 11 years old at most, yet she has an active nightlife and dating schedule, is apparently stoned, and looks 14 at minimum. * Jack’s father-in-law The Colonel is a big Bakersfield fan but lives in Taft, as best I can tell. Perhaps he has the main branch of his bank in Bakerfield and a small branch in Taft. At any rate, The Colonel should be a pariah in Taft, but there is no mention of this. * The father-in-law made Jack VP of the bank at what must have been age 18 with nothing more than a high school diploma, and certainly no experience. * Gigi dreams of being a singer, but sings early 60s girl group tunes that I think are supposed to represent her being stuck in high school. In what sense would someone who is emotionally stuck in 1972 be singing songs from a decade earlier? * The high school is Taft High School, but the football field is shown with the letters MUHS. Some of the dated jokes are unintentionally funny, the biggest one being how Reno is a loser because he pimps out vans and trucks in his garage. The artwork was, I surmise, a joke back in 1986, but nowadays people would pay good money for what he does. That wasn’t the only dated reference, as there was an extended joke about men doing aerobics. 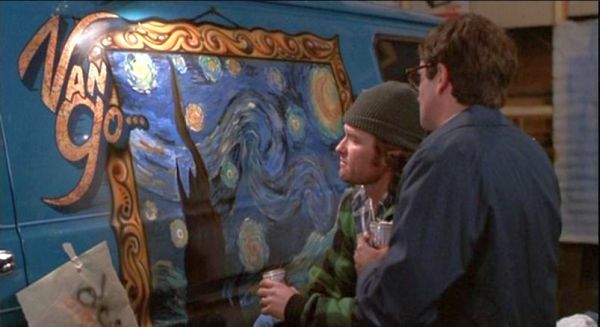 Van Gogh on a van. See? It’s funnay! Most of the comedy wasn’t actually funny, and last I knew, comedy was required to be funny. I could be wrong! Things change! The attempted humor was mostly bland, and Williams’ habit of reusing the same ad libs over and over since 1982 is tiresome. Now, it has been a long time since I was a Williams fan. I had his albums and watched “Mork and Mindy” religiously. Sorry, Universe; I was young! I don’t remember where, specifically, the ad libbed banter during the scene where he convinces Reno to play a rematch came from, but I do know it’s not original to The Best of Times. On more than one occasion, Williams was visibly laughing at his own jokes. The funniest bit in the movie is stolen. When Reno is trying to teach plays for the big game, he uses the ground and random debris to represent players, confusing teammate Carlos who thinks he’s the piece of glass when he’s really the twig. It probably sounds familiar to you, and there’s a reason for that. 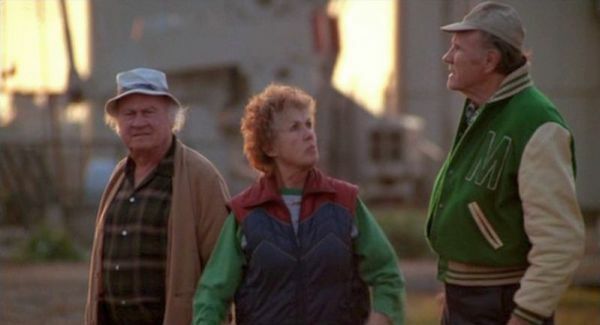 Dub Taylor, Kathleen Freeman, and R.G. Armstrong. M. Emmett Walsh and Carl Ballantine. 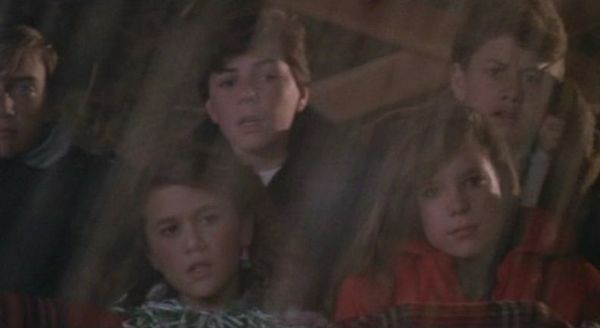 Then there was a surprise near-cameo at the end when Tracey Gold shows up in an uncredited bit part at the football game with future television brother Kirk Cameron… and isn’t that Holly Marie Combs sitting next to her? It’s hard to tell because of the Hollywood rain storm. I remembered The Best of Times from a previous viewing as being moderately amusing with a good football game at the end. I remembered wrong. The football game started out pretty exciting but then was edited down so much that it was impossible to get into the game, resulting in almost no payoff at the climax of the film. 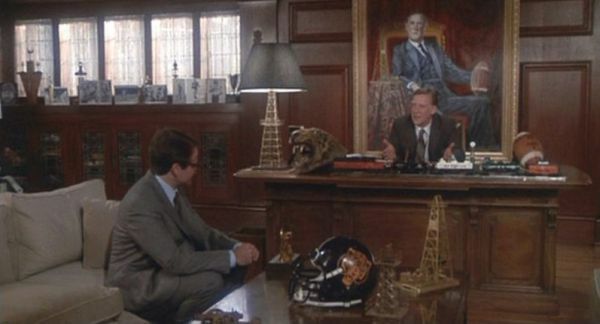 There is nothing I hate more than a sports film where the big game at the finale doesn’t deliver. Speaking of editing, there are several times in the film when language was dubbed over for less harsh words, and in one instance, breasts were deliberately hidden by hands and taped-on lingerie. There is a brief scene where Reno is talking to an old high school friend who is now the local “massage therapist.” The scene goes nowhere, there is another disconnected mention of his wife thinking he’s been sleeping with the massage therapist, and we never hear about that again. I would love to see what the original cut of this film was like, because I would bet it was grittier and better than this watered-down PG-13 blandfest. Great post Stacia. Just wanted to say the girl sitting next to Tracy wasn’t Holly Marie Combs but Robin Lively of Karate Kid 3 and Teen Angel. Why do I know so much meaningless trivia? Oh yeah because I’m a movie/TV fanatic. That’s Robin Lively? She had trendy 80s hair with a bunch of junk in it earlier in the film, and always wore sunglasses, so I didn’t recognize her! Thanks! This is where I admit I had trendy 80s hair with lots of junk in it, too. I’m the same age as Lively. Since I grew up in a town where football seemed to be the topic of conversation, The Best of Times resonates with me. Sure, it has almost as many plot holes as The Survivors…and for me, it matters not one whit. I’d watch either movie before sitting through Dead Poets Society again. Times also made me sit up and take notice of Pamela Reed (who, granted, I had previously glimpsed in Young Doctors in Love) who is now one of my favorite actresses. And some friends of mine and I swiped the secret lodge handshake between Russell and M. Emmett Walsh from this film. I <3 this movie.....This was going to be like in every one of my movie series this year, but I always forget about it. 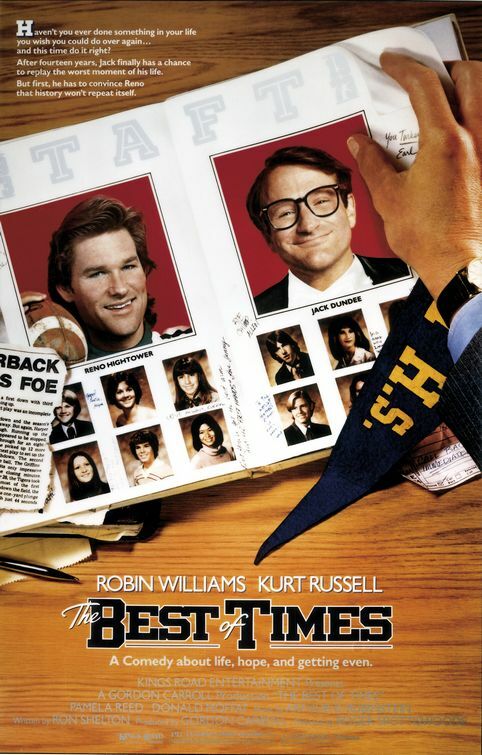 This is Robin Williams best role in the 80's, IMHO. I’d watch either movie before sitting through Dead Poets Society again. Oh hell, I’d probably sit through “The Maltese Bippy” before I watched DPS again. I would really have to consider it. I wanted to like this movie, and my memory was that I DID like this movie. A big part of the problem for me was that I recognized a bunch of great actors and I wanted to see THEM, not Williams, who I now loathe. Russell was pretty good, and he’s got great hair. Like, Gary Sandy levels of great hair. I liked Reed and Palance a lot, too. It’s the haze of the 80’s — I must’ve said “Wolfman’s got nards” a million times between the ages of 7 and 9….I like that memory. I haven’t decided if I want to ruin it by actually watching it again. I saw about as much of this movie as I could bear; fortunately, however, it was a free loaner from the library. 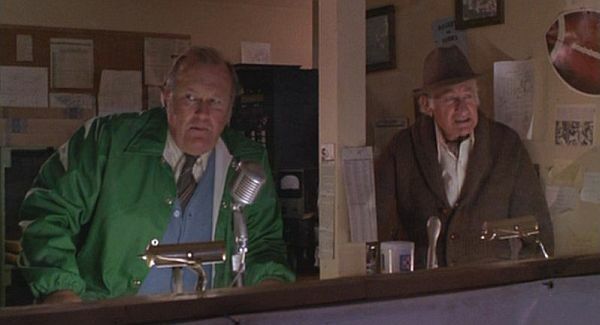 The presence of Kurt Russell and Donald Moffat made me wish I was watching The Thing instead. P.S. You have me curious now. Why do you loathe Dead Poets Society?